Riverview, N.B. resident Matthew Kinnie has always been very adventurous. “Pretty active guy, I really like being outdoors and doing outdoor activities,” describes Kinnie. “Anything like skiing, rock climbing, or canoeing, hiking, backpacking and that, was all the stuff I like to do in my spare time." But 14 years ago, Kinnie’s life took an unexpected turn when he was out rock climbing with friends. He knew right away that his injuries were serious…. Click here to read the full story and watch Matt’s interview with CTV Atlantic. Our new Ford Transit Ambulance was featured in the GMCC Chamber Vision Magazine. New Brunswick's own Malley industries — known for supplying Ambulance New Brunswick's fleet among other things — is expanding into the United States market with a sleek new ambulance based on a conversion of a Ford Transit. Jean-Marc Dugas, manager of safety programs for Ambulance New Brunswick, said the provincial ambulance service has started swapping out its current Ford E-350 models for Dodge Ram ProMaster emergency vehicles, designed by Dieppe-based Malley Industries, which won the contract from the Department of Health in 2014. Click here to read the rest of the publication. The Innovator of the Year Award recognizes those companies who have successfully employed innovative marketing techniques, for example, social media strategies, to expand their export markets, and/or companies whose products are seen as cutting edge in terms of innovation. Click here to read the blog post from Opportunities NB. including wheelchair-accessible vans for the disabled. nouveaux véhicules remplaceront les 134 ambulances de la province d’ici quatre ans. Dieppe company played key role in developing ambulances of tomorrow. A new generation of ambulances was unveiled on Monday in Moncton, with the bulk of the vehicles’ innovative features developed by a Dieppe firm. MONCTON, NB – The ambulances of today are on their way out. Ambulance New Brunswick (ANB) is transitioning its fleet of 134 ambulances from the current Ford E350 chassis to a Dodge Ram ProMaster. The first vehicles start serving patients in the coming days. As one vehicle comes to the end of its lease and is returned to the manufacturer, it will be replaced by the next generation ambulance. The move to a new ambulance was a necessary change, said Danny Bulmer, ANB’s provincial fleet manager. 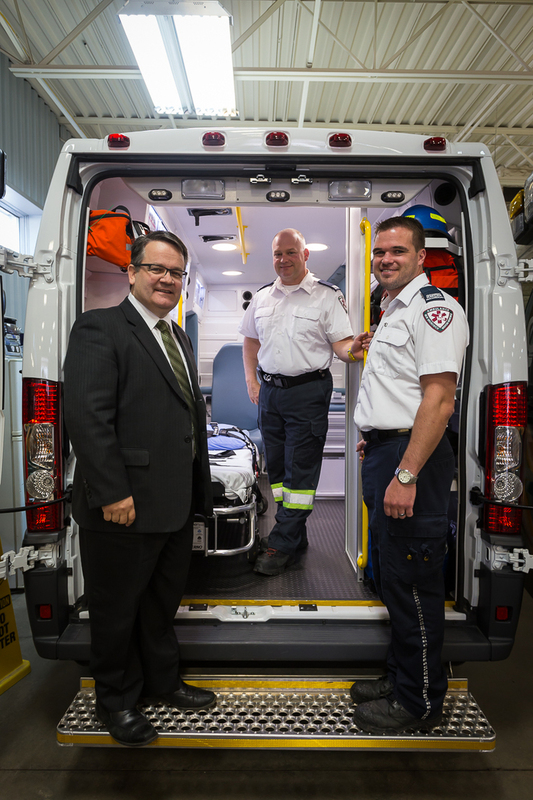 For the past two and a half years, ANB has been working together with paramedics in the field, New Brunswick’s Department of Health, and research and development team at Dieppe-based ambulance manufacturer Malley Industries to create an industry-leading ambulance. “When we started down this road in 2012, we had three top priorities: to further enhance safety and comfort, to improve access to patients and equipment, and to optimize the interior space where paramedics spend their days treating patients,” said Jean-Marc Dugas, ANB Safety Programs Manager. Ambulance New Brunswick expects to introduce approximately 40 new Ram ProMaster vehicles to its fleet between now and the end of the fiscal year (March 31, 2016), as Ford models exit operations. MONCTON (N.-B.) – Les ambulances d’aujourd’hui approchent la fin de leur voyage. Ambulance Nouveau-Brunswick (ANB) changera sa flotte de 134 ambulances du modèle de châssis Ford E350 courant à un modèle Dodge Ram ProMaster. Les premiers véhicules commenceront à servir les patients dans les jours à venir. Les véhicules qui atteignent la fin de leur bail seront retournés au fabriquant et remplacés par la prochaine génération d’ambulances. Le changement qui mena à des nouvelles ambulances était nécessaire pour ANB, selon Danny Bulmer, directeur provincial du parc d’ambulances d’ANB. Au cours des derniers deux ans et demi, ANB a travaillé avec des travailleurs paramédicaux sur le terrain, le ministère de la Santé du Nouveau-Brunswick et l’équipe de recherche et de développement de Malley Industries, fabriquant d’ambulances basé à Dieppe, afin de créer une ambulance qui soit en tête de l’industrie. « Quand nous nous sommes embarqués sur cette route en 2012, nous avions trois priorités : améliorer la sécurité et le confort, assurer un meilleur accès aux patients et à l’équipement et optimiser l’espace intérieur où les travailleurs paramédicaux passent leurs journées à traiter leurs patients, » explique Jean-Marc Dugas, responsable des Programmes de sécurité d’ANB. Ambulance Nouveau-Brunswick s’attend à introduire environ 40 nouveaux véhicules Ram ProMaster à sa flotte d’ici la fin de l’année financière (31 mars 2016) alors que les modèles de Ford seront retirés des opérations. Serge Leblanc (au centre) et Jerome Scott (à la droite), travailleurs paramédicaux, figurent dans la photo avec Victor Boudreau, ministre de la Santé. Pour information en français, cliquez ici. 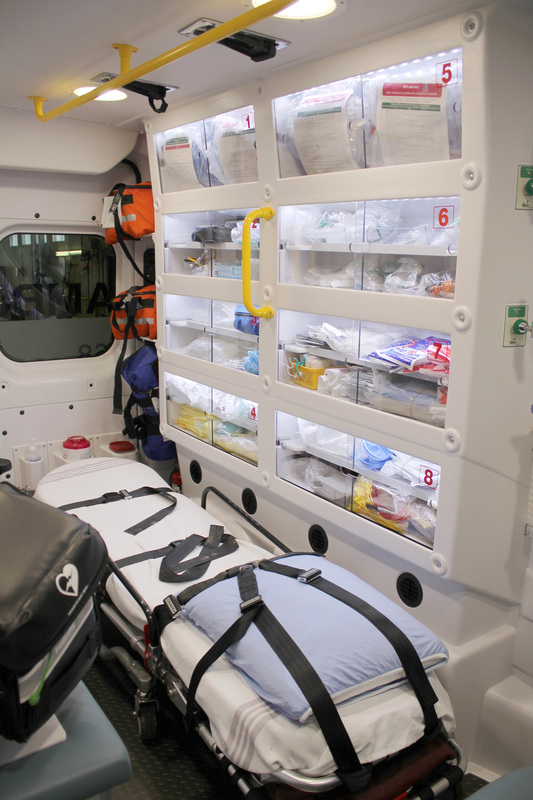 With the introduction of the Ram ProMaster to the North American market, Malley Industries saw an opportunity to design an ambulance in which they could accommodate the needs of paramedics using new materials. Read the December 2014 / January 2015 issue here.